Master Gardeners are trained and certified by the University of Georgia Extension Program. For more information about the UGA Extension Service and how to become a North Fulton Master Gardener, click here. Our mission is to provide horticultural education, service and inspiration in the North Fulton community. 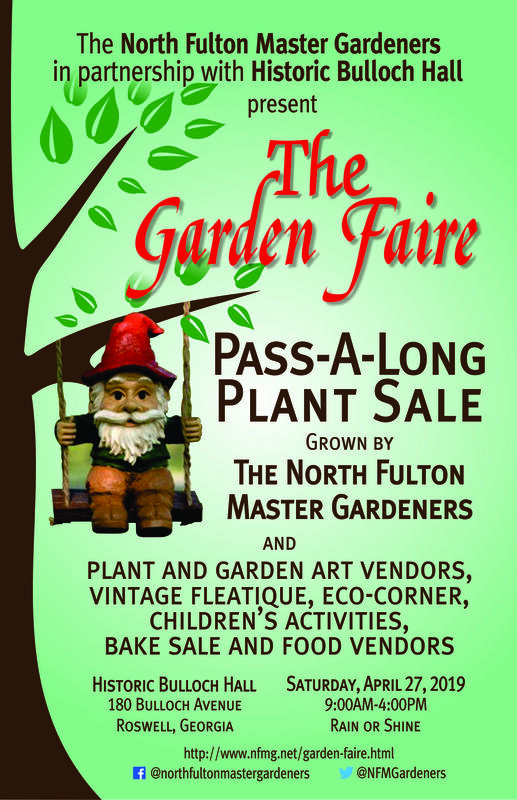 We are seeking plant and garden arts/crafts vendors for the 2019 North Fulton Master Gardener Garden Faire scheduled for Saturday, April 27, 2019 from 9:00 a.m. to 4:00 p.m. at Historic Bulloch Hall in Roswell, Georgia. We are pleased to once again partner with historic Bulloch Hall and the Roswell Azalea Festival in bringing Garden Faire to the community. Whether rain or shine, we anticipate a very good turnout for the Faire as we have had in past years. The UGA Extension in Fulton County and North Fulton Master Gardeners conduct classes to provide up-to-date horticultural programs to the community. Topics include lawn care, perennials, vegetable gardening, maintaining shrubs and roses, and more. Classes are offered in Alpharetta, Farm Chastain, Roswell, and Sandy Springs. Master Gardeners are available to speak at your next meeting or event on a multitude of topics. To request a speaker, contact Carol Brooks at 770-641-7638 or email speakers@nfmg.net.